While it is true that many dogs have a hard time adjusting to any shelter due to dire circumstances, this one dog’s case was an exception. 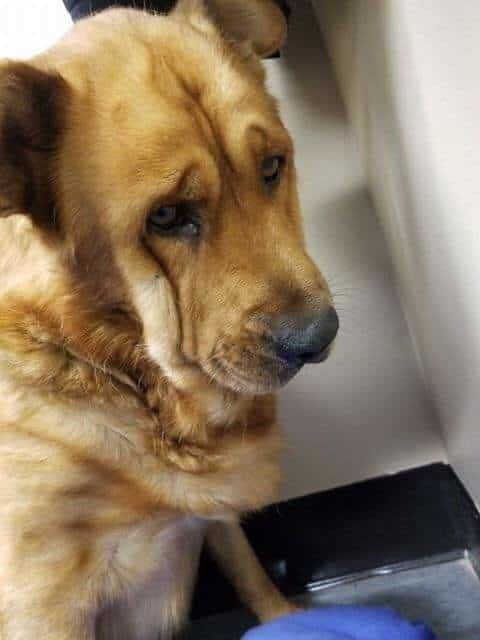 They called him the Saddest Dog in Detroit – not because the shelter’s living conditions were substandard or anything; it’s just that this poor doggo had a heartbreaking story to share. They called him Rio, an aged golden retriever whose owner had recently passed through. Since dogs are categorized as man’s best friend and given that they can grow attached to their masters, Rio’s case was a little different. The fact that this dog was over 10 years old, he had an inseparable bond with his previous owner. Naturally, when the dog’s owner passed away, the poor animal was emotionally devastated. Things were taking a toll on the dog’s physical and mental well-being to the point that even the shelter owners felt a huge wave of depression hitting them every time they laid their eyes on Rio. What Rio was going through was not normal behavior. Yes, a lot of dogs go through rapid changes and they demonstrate unstable behavior, but Rio was clearly taking it all to the next level. 17. What Does The Detroit Animal Shelter Owners Have To Say? Rio arrived at the Detroit Municipal Shelter not too long ago. At first, he refused to eat or drink anything. The shelter owners thought that the dog’s refusal to cooperate was a natural reaction to his new surroundings. However, day by day, Rio would continue to neglect his surroundings. 16. The Dog Wouldn’t Cooperate! There came a time when Rio refused to maintain slightest eye contact with any human or other dogs for that matter. In fact, there were several occasions when shelter keepers found this poor golden retriever awake during wee hours of the day/ night. It was clear that the dog had gone through a recent traumatic experience. Eventually, one thing led to another and Detroit Municipal Shelter owners found out that Rio had recently lost his owner. The dog just wasn’t ready to “accept” the reality, and move on to a new life with some other owner. During his worst days, Rio would stand in one corner with his head bumped up against the wall. Something had to be done immediately. Employees at Detroit Animal Care and Control decided to help Rio. They would spend extra hours with Rio in an effort to lift his mood. During their work hours, the employees spent most of their time into looking for a potential dog owner. The problem was that Rio wasn’t ready to accept anyone, until this man came along. 10. Is Rio’s Case Applicable to All Kinds of Dogs? Dogs are basically descendants of wild wolves and other predators. Over several decades, their shape and form evolved into “cuteness” which helped them to stay with their human companions. Dogs associate human beings with a safe refuge where they have someone to take care of them. In this context, dogs, as a domesticated species, know that the person’s life is important because he takes care of the animal in return. Naturally, the same dog would be disturbed if something were to happen to his owner. Some call it survival instinct, while others think that it’s the animal’s way of showing affection. On the contrary, several studies revealed that what Rio the Saddest Golden Retriever in Detroit is experiencing is the most extreme form of love. He adored his previous owner, and now he’s grieving the loss of that person. 7. One Man Decides to Intervene! It was only then that the Detroit Animal Care and Control Center’s very own employee: Ryan Callahan decided to give the dog a new foster home. Both Ryan and his wife knew what they were up against because Rio was an older dog. Young dogs are easy to take care of, but older dogs have the tenacity to demonstrate rigidness. To get started, Ryan and his wife made a special room for Rio. They started with redecorating a few things and noticing how Rio would react. As a result, Rio the “Saddest” golden retriever began to react by slowly easing up a little. There came a day when Rio would go to Ryan and even sit in his lap if he called his name. It was then that Rio also began to look Ryan in the eyes as a way of showing recognition towards the new owner. Ryan thought that since Rio was now on the road to recovery, it would be okay to send him back to the Detroit Animal Care and Control Center. However, his wife intervened and decided they should keep the dog. If Rio realized that he was “betrayed” again, perhaps he’d never be able to recover again. Such dogs sometimes expire pretty soon if they are abandoned twice, or something bad is to happen. Ryan’s theory towards Rio’s recovery is that the poor animal just wanted someone who’d dote extra care. At this point, Ryan’s best hope is to not leave the dog or give him up to another adoption center. Meanwhile, the director of the Detroit Animal Care shelter hopes that Rio finds semblance and happiness at his new place. “We have helped the dog through thick and thin after he suffered a tremendous loss. We will continue to do so if any situation calls for it later,” said Kristina Millman.